Implant-held dentures offer people struggling with major tooth loss a means of remarkably improving their experience with dental prosthetic support. Rather than leaving your dentures in place with suction, or with epoxies, you can have them supported permanently with strategically-placed mini dental implants. This arrangement can make you feel more comfortable with your dentures, and make it easier to bite and chew with them. If you have questions, or if you want to see if you can be approved for implant placement, let your dentist know. Because implant-held dentures use mini implants, they can be easier to safely secure than full implants. Why Should You Consider Having Implants Placed To Hold Your Dentures? 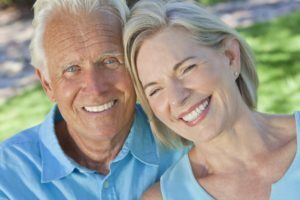 For some people, the idea of dentures that are firmly kept in place will be reason enough to inquire about implant-held dentures. People can grow frustrated when their dentures fail to stay in position. Over time, changes in your jaw can affect how secure they are, making the problem worse. With implants in place, you can keep your dentures secure, even when biting and chewing food. You can also look forward to better jawbone health, as implants will prevent a deterioration of the bone, which can occur when you have experienced tooth loss. Your dentist can examine your jaw, and make sure you qualify for implant placement. It can be easier to be approved for mini implants, as they need less support from your jawbone. It should be noted that the placement does require oral surgery. If you have any health issues that make surgery harder to approve, it can interfere with your ability to receive approval. At Wager-Evans Dental, patients who want to enjoy a better prosthetic dental experience can learn more about implant-supported dentures. With dentures held by implants, you can have an easier time biting and chewing, while also avoiding problems with poorly secured dentures. Located in Reno, NV, we are proud to welcome residents from South Meadows, Double Diamond, Caughlin Ranch, Donner Springs, Meadowood, Sommersett, Arrow Creek, and all surrounding communities. To set up a consultation, or your next dental appointment, you can visit our office, or contact us today by calling (775) 829-7700.